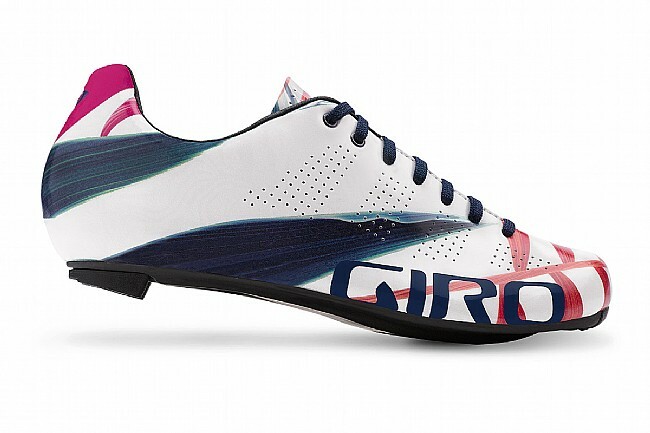 Giro's Women's Empire ACC Road Shoe has the sleek and classic look of road shoes of old. But looks can be deceiving—beneath this shoe's sleek exterior is a high-performance full-carbon sole made of Easton's high-end EC90™ ACC carbon. This stiff sole's low 6.5mm stack height will deliver performance and power without compromise. The shoe's breathable Evofiber™ microfiber upper complements the Women's Empire ACC's classic lace-up closure for adjustability that's never really been improved upon by other manufacturers' ratchets and straps. Plus, the customizable SuperNatural Fit footbed offers fine-tuned arch support for a shoe that'll keep you comfortable and efficient on rides of any length. Heel pads are replaceable. Claimed weight: 210 grams (size 39). Compatible with three-bolt road cleats.